This magical milkshake recipe turns a classic Halloween candy into a spooky sweet treat. 1. Soften ice cream slightly. Scoop ice cream into a large bowl; add milk and agave nectar. Cream together with a mixer. 2. Divide ice cream mixture equally into 3 bowls. Put one bowl in freezer. 3. Using food coloring, add a couple of drops of yellow to the second bowl and a couple of drops of orange to the third bowl. Stir well. Work quickly. Place bowls into freezer until the milkshake mixture thickens up. 4. 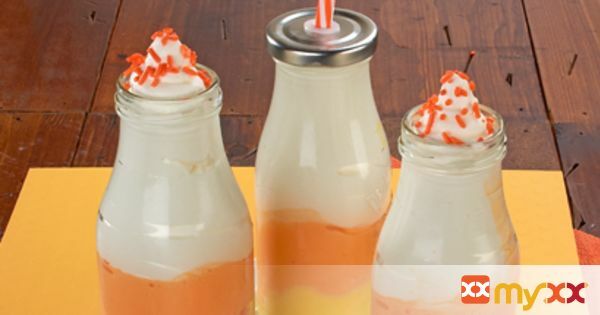 To Assemble Candy Corn Milkshakes: Add yellow mixture to each glass. Add orange mixture on top of yellow. Finish with white milkshake mixture. Top with whipped cream and sprinkles.